SIEM REAP - The Cradle of Angkor Civilization - Where Cambodian were Born, this is also a famous Archaeological City, as named as one of the seven greatest architectural wonders of the World. Covering approx 600 sq km, it contains more than 100 fabulous ancient monuments and over dozen major compound Temples, which were built during the most splendid Era of the Khmer Dynasty between the 9th–13th centuries and were the ancient capital of the Khmer Empire. You will see everything in Hindu religion from Ramayana, Mahabharata to Samudramanthan—all engraved on this grand Angkor temple and Angkor Thom. breakkfast, proceed to visit Angkor Wat Temples – one of the seven greatest architectural wonders of the world, as a temple and mausoleum for King Suryavarman II at the peak of the Khmer empire in the first half of 12th. Angkor Wat is probably the best-preserved of the Angkorean temples, with a central tower surrounded by four smaller towers. The central monument represents the Mythical Mount Meru, the holy mountain at the centre of the universe, which was home to the Hindu God Vishnu. The whole complex covers 81 hectares, a rectangular wall measuring 1025 meters by 800 meters borders the inner edge of the moat, and temple's greatest sculptural treasure is its 2 km-long bas-reliefs around the walls. Also visit Ta Phrom Temple: a monastery built by Jayavarman VII as a residence for his mother. Ta Prohm has been controversially left to the destructive power of the jungle to show how nature can destroy man's work. It has been largely over grown by the jungle and as you climb through the dilapidated stone structures you see many giant trees growing out of the top of the temple itself. After Lunch, visit Banteay Srei - is a 10th-century Cambodian temple dedicated to the Hindu god Shiva . Temple is renowned for its intricate decoration carved in pinkish sandstone that covers the walls like tapestry. Back to the hotel for rest. After breakfast proceed to discover Angkor Thom – Temple City. Visit very famous Bayon Temple (12th century in the centre of city remains one the most enigmatic temples of the Angkor group composed of 54 gothic towers decorated with 216 smiling faces of Avalokitesvara. Then visit Baphuon Temple is lying just to the north of Bayon a pyramidal representation of mythical Mont Meru. Terrace of Elephants used as a giant reviewing stand for public ceremonies and served as a base for the king’s grand audience hall ; Terrace of the Leper King a platform 7m high, with his statue; It’s Angkor Wat style is most easily seen in the style of the carved Apsaras and the shape of the tower, Chaosay Tevoda, it seems to stand in partnership with Thommanon but actually was built much later in Suryavarman II’s rule. After Lunch, visit to Wat Thmey (The Killing Fields). The Wat Thmey Temple is notable for being an area that served as one of the killing fields during the Khmer Rouge regime in the country. The Khmer Rouge was Cambodia's ruling party from 1975 to 1979 and was responsible for one of the worst mass killings during the 20th Century. Under the leadership of Pol Pot. HO CHI MINH CITY a young city with the age of more than 300 Yrs, a centre of culture, education, commerce and tourism of Vietnam, the biggest city of Vietnam mix with the West and the Orient and once known as the "Pearl of Far East"
Breakfast, Check Out hotel, transfer to airport to board the flight to Ho Chi Minh City (Vietnam) Lunch – directly proceed for HO CHI MINH CITY Tour, visit War Remnants Museum - drive home so effectively the brutality of war and its many civilian victims, first those of the French and then those of the Americans, who had operated at various locations of the country as early as 1954. Photo-stop at Neo-Roman Notre Dame Cathedral - one of the most splendid and typical of the beautiful French-built churches in Ho Chi Minh City, next Municipal Post Office - Saigon's French style main post office to admire and take photos of its nice architecture that is one of the Ho Chi Minh City’s symbolizing images. Later, pass by Ho Chi Minh City People’s Committee Hall and Municipal Theatre built in 1899. Late Dinner. Breakfast, take an interesting excursion to Mekong River, overland 70 km to My Tho Town - the "Gateway of Mekong River and its Delta". Mekong Delta - the rice granary of Vietnam and has vast areas of durian, mango, rambutan and other delicious tropical fruit trees. Arrival My Tho and transfer to the bank of Mekong River, take a motor river-boat which to be rent exclusively for the group then crossing the Upper River and cruising along Tan Long Peninsula, let’s enjoy this golden moment to relax the verdant luxuriant sceneries of the watery region, taste very fresh coconut milk, disembark and visit a island, stop-over a Handicraft Village that produces house-hold items from materials of coconut trees. Walking on the quite country roads, you will reach to local lush orchards, taste delicious fresh fruits, drink hot tea with honey. Enjoy a short Tilbury Carriage Tour on the village road, enjoy small Boat trip along the canal network with a bit of adventure mood in Ben Tre Province to visit a bee farm and then a coconut candy workshop. Till now rivers and artificial canals are an important circulation system of the Mekong Delta. After that, take boats to come back to My Tho city. After lunch, drive back to Ho Chi Minh City. On the way stop at Vinh Trang Pagoda - an ancient southern architectural gem in Tien Giang Province. Vsit Lacquer-ware gallery for demo and shopping. Transfer to the hotel. Free time for rest. Breakfast, visit the Reunification Palace – a symbol of Saigon old Government before 1975. Then directly proceed to visit Cu Chi Tunnels located at the threshold of Saigon (Ho Chi Minh City) and adjacent to the revolutionary base, played an important role in the two wars before 1975. Cu Chi was an "Underground Village" with its labyrinth of interlaced tunnels having a combined length of more than 200 km of tunnels built here by the Communist guerrillas are the highlight of South Vietnam tours. You will be guided to the bedrooms, meeting rooms, air-raid shelters, smokeless kitchens, and experience life underground during your short visit to this extraordinary tunnel complex. Opportunity to crawl into the tunnels for discovering and hearing all things of it. After lunch, drive back to Ho Chi Minh City. Transfer to airport to board a flight to Danang. Arrive – Transfer – Dinner – Check in Hotel. HOI AN ancient town lies on the banks of the Thu Bon River, has a distinct Chinese atmosphere with low, tile-roofed houses and narrow streets; Occupied by early western traders, Hoi An was one of the major trading centres of Southeast Asia in the 16 th century. All the houses were made of rare wood, decorated with lacquered boards and panels engraved with Chinese characters. Pillars were also carved with ornamental designs. Breakfast– proceed to explore Hoi An ancient town, walking tour. Visit the Japanese Covered Bridge where retains a harmony of architectural styles, combining Chinese, Vietnamese, Japanese cultural characteristics. Ong Pagoda is one of the typical pagodas in Hoi An’s old quarter, built in 1653 and is dedicated to Quan Thanh De Quan (Quan Van Truong). Fukienese Assembly Hall was built in 1692 by Chinese Phuoc Kien merchants, is architecturally unique with its artistic ornaments and beautiful statues, Chinese architectural style combined with Vietnamese workmanship has enriched it with Hoi An’s cultural character. Tan Ky Ancient House, constructed almost two centuries ago as the house of a Vietnamese merchant. Lunch. After lunch visit to famous Marble Sculpture. Back to hotel. On the way photo stop at Danang Beach. Evening free at leisure. 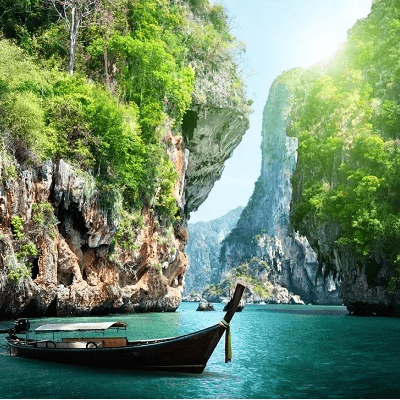 HALONG BAY is nearly a hidden bay with Thousands of limestone islands densely rising from the blue jade water in a sea area of over 1500 square km. Its 1969 green islands enfeeble the strong winds blowing from the ocean to leave the transparent water of the bay often calm in cool and healthy air. From time to time, sailing Junk appearing and disappearing between the islands make the poetic sight more colourful like sparkling pearls or coral reefs found out in the bay. The beauty of the bay is not monotone, at different positions of viewing, it will astonish viewers with quite different fascinations. Breakfast & proceed to enjoy a full day Tour of Hanoi, which is capital city of Vietnam. Visit to the Chairman Palace area, Ho Chi Minh Mausoleum (from outside), Ba Dinh National Square, Stilt House; One Pillar Pagoda, a nice group picture should photo in the parade yard of Ba Dinh National Square with the great back view of Ho Chi Minh mausoleum. The Temple of Literature is a classic Confucianism temple and a huge statue The first university in Viet Nam was founded here and many rows and rows of big stone slabs that sat on the backs of stone tortoises.